These bar height stools come in a variety of frame and seat materials, ensuring a pleasant atmosphere while also fitting into your existing decor. 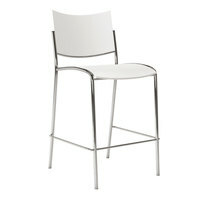 While the majority of these stools are bar height, we also offer counter height stools for increased flexibility. Several of them are also stackable, which makes for easy and compact storage. Also make sure to check out other great items from Lancaster Table & Seating, LT&S Boomerang, LT&S Spartan Series, American Tables & Seating, BFM Seating, Flash Furniture and Holland Bar Stool. Commercial bar stools usually have metal or wood frames with mahogany, natural wood, walnut, or cherry finishes. These style combinations create a polished look, while also keeping customers comfortable. We also offer ladder, slat, window, and perforated back styles, which add a touch of style and flair. For related products, check out our barstool parts and accessories, reusable plastic barware, and bar towels. If you're wondering where to buy mayline restaurant bar stools, we have a large selection of mayline restaurant bar stools for sale at the lowest prices.